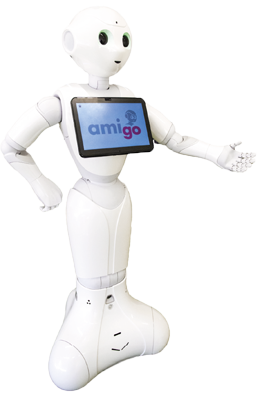 The objective of the project AMIGO is to develop an innovative multisensory robot platform based on the social robot Pepper for the entertaining motivation of people with dementia to perform daily activities in a concept of integrated multimodal training. The robot is capable to involve clients in natural dialogues, informs about recent posts of relatives or news from all over the world and may diagnostically ask about their health status, and Pepper will be able to adjust its dialogue style based on emotional feedback sensed in interaction. The system motivates to perform personalized exercises, to stimulate cognitive processes and physical activities, and to maintain social bonds. Sensors for eye tracking and motion analysis technologies offer affordances for entertaining, sensorimotor sequences and for data capture and analysis of cognition and locomotion specific behavioral parameters. Easily usable interfaces enable planning and autonomous daily practice to formal as well as to the informal carers in a weekly rhythm so that people with dementia can stay longer at home, with the aim to slow down the progress of dementia. The Projekt AMIGO (No. 862051) is funded by the program benefit of the Austrian Research Promotion Agency (FFG) and the Federal Ministry of Transport, Innovation and Technology (bmvit).